...I'm looking forward to the future here in Long Beach. We've got a lot of flights starting here over the next 60 days. We're prepared for 'em. The Airport is prepared for 'em. They've worked really hard to make sure that those things happen, and that the customers are not disappointed when they arrive at these doors. And so, thanks for all of you, especially at the Airport and the City Council for all the great things that you've done. 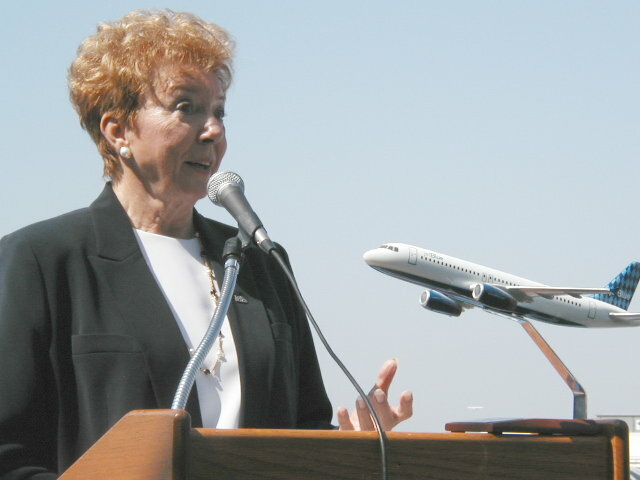 So without saying any more, I would like to introduce the Mayor, Beverly O'Neill, who's been a great supporter of JetBlue's from day one and a good friend, and we're so thrilled that we can introduce her as the Mayor this day. 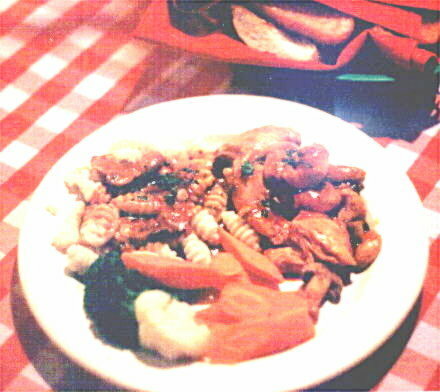 [rousing applause]. ...Thousands and thousands of people have gone to New York and eastern cities and avoided the congestion of LAX and also of John Wayne, and not only have they proven that there is a need for additional destinations, they've become a partner working as part of the city. They have become an integral part of making sure that this is a good city and they're good corporate partners. You know, we've always known that Long Beach is a great place to travel from. And for years, [flight] slots went begging. We knew that it was a great destination. The freeways that give access, the airline industry didn't understand that. 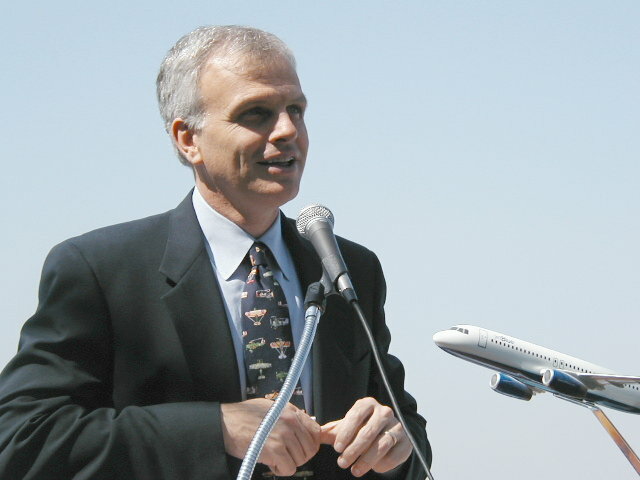 However it took David Neeleman to make sure that they knew that, and now [chuckles] we're becoming a hot commodity, more than we want to be. And people are finding that they like leaving from Long Beach. Members of our community call me monthly and let me know how much they appreciated what Long Beach has done to provide their travel and make it easier. So JetBlue is doing that with on time flights and good fares and desirable destinations. But of course when you have success, you do have to meet that success. One of the things that we needed to do was to make sure that when we had additional passengers, we had places for them to sit down while they waited for the flights. And so it's been a scramble to meet that need of improving the comfort of the passengers but we are on the way to make sure that they are accommodated in the way that we would want to be accommodated and our citizens would want to be accommodated. ...We do have things that we still need to work out. For those of you that are part of our community, you remember that last Tuesday night [August 27] we had a long meeting with the Council on making decisions for how can we stay within our means and make sure that we still accommodate passengers. 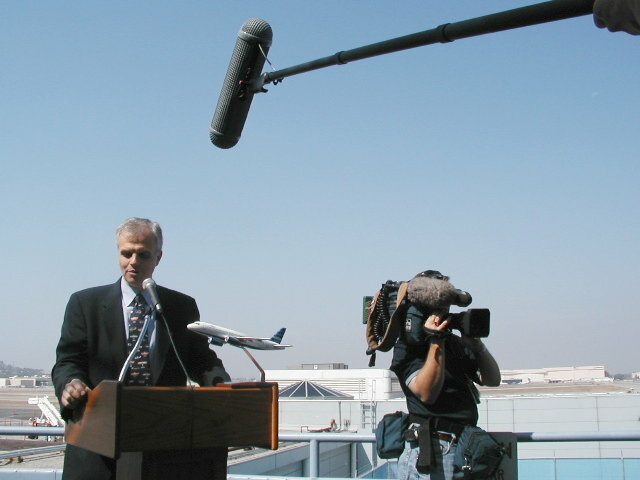 Mr. Neeleman: ....We do take our community responsibilities very seriously. 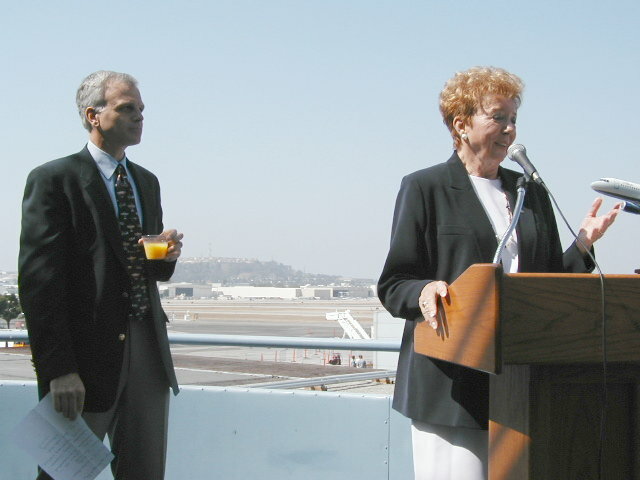 From the minute we walked through the doors here, we promised the city that we would not only provide convenient, high quality, low cost transportation for our customers but we would also fly the quietest airplanes in the sky, and that we would also fly the most emission friendly airplanes in the sky. [A]irplanes are not the quietest things on the planet, but you can have quieter airplanes...You can have quiet airplanes. You can have emission friendly airplanes. And so it's important for us to be part of the community where we can run quiet operations. It's obvious that people need to fly. We can't go back to covered wagons. They didn't make nearly as much noise as maybe an airplane like this [points to taxiing aircraft] but there is a way to do it, and we're committed to doing it right and being part of this community and being environmentally friendly, which is very, very important to us. And we'll make that commitment in the future that we'll continue to do that as well. No old, dirty, smelly airplanes, noisy ones coming into this airport. 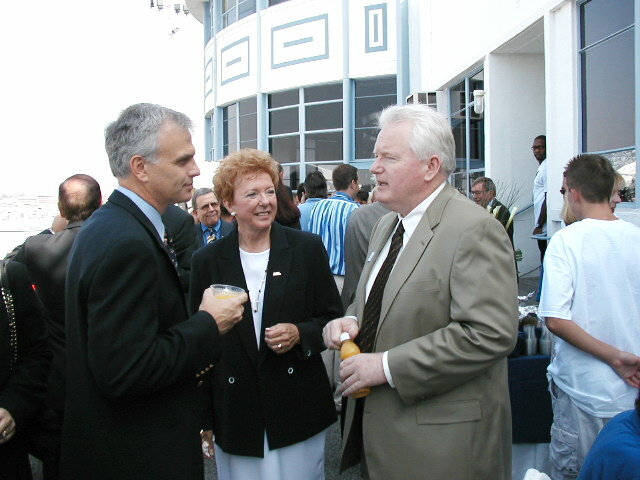 Jet Blue CEO David Neeleman, Mayor Beverly O'Neill, Press-Telegram publisher Ian Lamont. 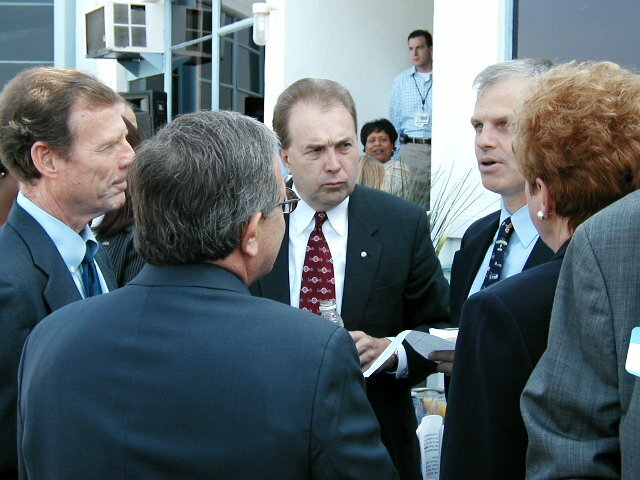 Jet Blue Western Region Gov't & Community Affairs Mgr. 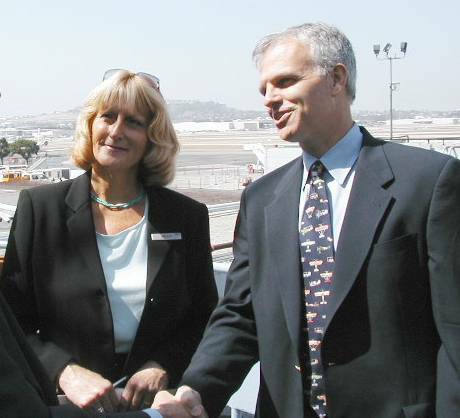 Kristy Ardizzone & Jet Blue CEO David Neeleman were all smiles. 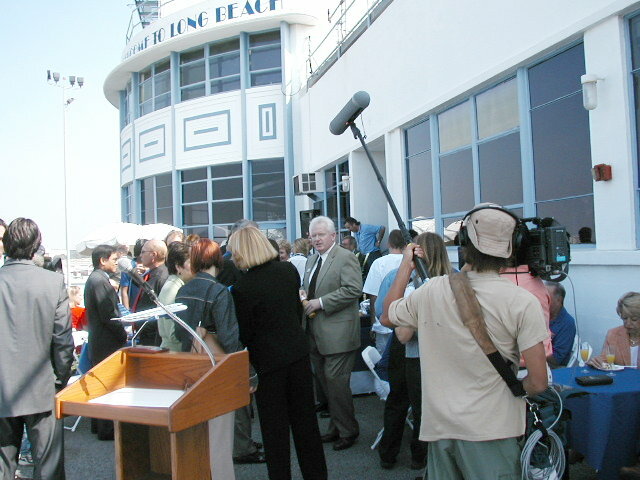 Among the LB VIPs we spotted in attendance: City Prosecutor Tom Reeves, downtown LB banker Jane Netherton, Gazette newspapers' associate publisher Harry Saltzgaver, Airport Advisory Commissioners Berhnard Clever and (chair) Ron Salk, Beachcomber publisher Jay Beeler, 5th district Council aide Tim Patton, 4th district Council aide Deanne Smith, and LB aides from the offices of County Supervisor Don Knabe (Matt Knabe), Assemblyman Alan Lowenthal (Melinda Cotton) and Assemblywoman Jenny Oropeza (Sharon Weissman). JetBlue received congratulatory written recognitions from Assemblymembers Lowenthal, Oropeza and state Senator Betty Karnette. 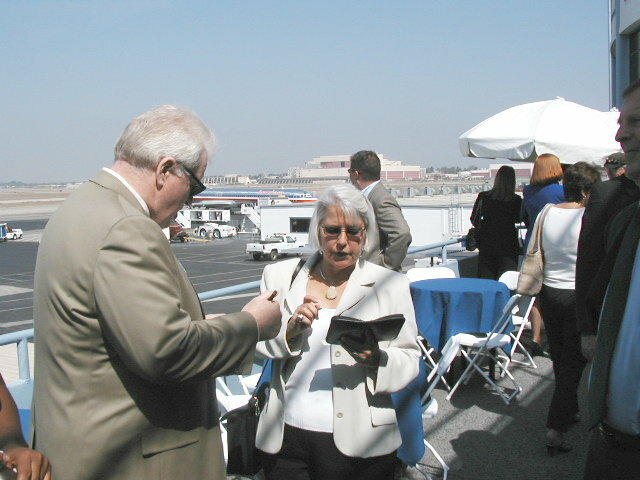 1st District Councilwoman Bonnie Lowenthal and PT publisher Ian Lamont share a word.